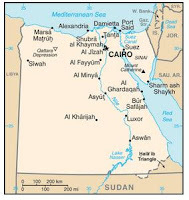 Over the 2014-2015 winter season Egypt reported the largest outbreak of human H5N1 infection on record - roughly 160 cases - quadruple anything Egypt had ever reported before (see EID Journal: H5N1 In Egypt). These represented only those patients sick enough to be hospitalized, and lucky enough to be tested. It is assumed that some (possibly large) number of cases were mild and went unidentified. After the first couple of dozen cases, Egypt's MOH stopped publicly acknowledging human infections (see Regarding The Silence Of The Egyptian MOH). This winter - despite numerous media reports of suspected cases - the Egyptian MOH has insisted the country is free of H5N1 cases (see Egyptian MOH Statement: No Bird Flu Cases Since Last Summer), instead describing severe flu cases as H1N1. 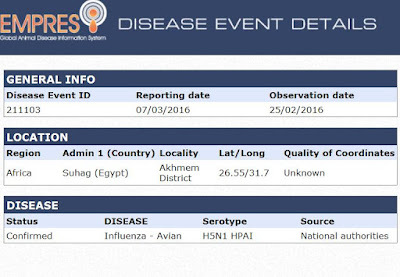 Today, via a brief report delivered through the FAO/EMPRES portal, we get what appears to be confirmation of the first H5N1 case of 2016 in Egypt. 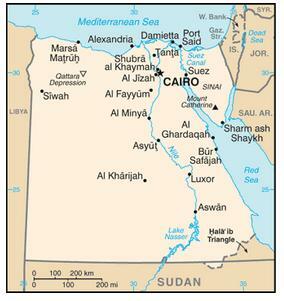 Other than the location (Sohag), and the observation date (Feb 25th), few details are available. Hopefully we'll get more details either from the Egyptian MOH, or from the WHO, in the coming days.